Roger Marsh: According to research compiled by the American Psychological Association, nearly half of all marriages end in divorce. The pain of this split goes beyond the two people involved. The children caught in the middle are profoundly hurt and can drag this pain into their future relationships. This is Family Talk, the radio broadcast division of the James Dobson Family Institute, and I'm Roger Marsh, filling in for Dr. Dobson today, who is out on a writing assignment. In just a moment, Dr. Tim Clinton will tackle the issue of divorce with licensed counselor, Dr. Gregory Jantz. Dr. Jantz is a mental health expert. He's also the founder of The Center, A Place of Hope, in Washington. He has authored nearly 40 books and appeared on numerous TV and radio programs across the country. Today, Dr. Jantz and Dr. Clinton will discuss the idea of parental alienation. This appalling tactic is often used by disgruntled spouses to manipulate their kids into hating the other parent. It's a destructive method that further destroys already broken relationships. Here now is Dr. Tim Clinton to introduce this topic and his guest on today's broadcast of Family Talk. Dr. Clinton: Well, hello, everyone. I'm Dr. Tim Clinton filling in today for Dr. James Dobson here on Family Talk, a program that is being built and supported by the James Dobson Family Institute. Our special in-studio guest Dr. Greg Jantz stops by from the Hope Center out of Seattle, Washington. Greg, so great to have you. Dr. Greg Jantz: It's always good to be here. Dr. Clinton: Greg, we are going to take on a tough topic today: parent alienation syndrome. This is going to be difficult to get through, but I think it's a topic that we've got to address because we're seeing more and more of it. Let's step back for a moment, Greg. Divorce is all too common in our world. What it does is it creates a lot of pain and hurt, anxiety for families. There are many families out there who, maybe by no choice of their own, Greg, that's the situation they find themselves in, and they've got to figure out how to go forward. It's tough. Dr. Greg Jantz: It's tough, and we're going to talk about some of the effects on kids today. Dr. Clinton: Greg, to get started, years ago, when I was reading about divorce, psychologist Lee Salk said this, divorce hurts kids, period. Period. Dr. Greg Jantz: There's always pain. Dr. Clinton: -it's a journey. Dr. Clinton: They often feel caught in the middle. Greg, I mean, torn between parents. Right? I mean, how do I respond to mom? How do we respond to dad? Why us? Why our family? So much more. Greg, you've ministered to a lot of families that've gone through this journey. What are some of the common themes that you've seen? Dr. Greg Jantz: Well, some of the things that we're going to look for is, it's really easy for the kid, unintentionally, to make comparisons and begin to put in that place of divided loyalty, who am I loyal to? Sometimes, it's not necessarily with any malicious intent, but the kid is trying to figure out, where do I fit in? The question that arises is, who do I like most? Who do I want to ...? And so they're being forced to make decisions a lot of times that they're really not old enough or mature enough to make those decisions. Dr. Clinton: Sure. A somewhat controversial topic is this issue of parental alienation syndrome. Greg, it kind of specifically takes us a little deeper in that there's an intentionality now that's going on. It isn't just the normal, "Hey, I want to be with mom, I want to be with dad, and I hate this, and why can't we just all come back and be one happy family all over again," and trying to navigate all that. For whatever reason, this is the situation they're in. But PAS goes deeper. This is where I think there's some real pain, say, between mom and dad, and now they're kind of taking it out on each other, and the kids aren't just caught in the middle. Now they're getting played in the middle here. Dr. Greg Jantz: They are the pawn, so to speak. Dr. Greg Jantz: One of the things that can happen is we get the power plays going on, we get the situation where it becomes very toxic. What I mean by that is the toxicity is the kid is absorbing perhaps the anger, the frustration. The kid is the sponge that's filling up on all these toxic emotions between the parents. Dr. Clinton: In that journey, what starts happening is one parent gets shoved into a different direction away from the family, ostracized, and the hate starts building. You can get to a place where they start playing games over contact, like visitation rights, you know what I mean? Whose weekend is this, whose weekend isn't this? It's the, "Not taking responsibility for what I need to be taking responsibility for," you know what I'm saying? Dr. Greg Jantz: "Wherever I feel love and accepted," that's where the kid's going to go. Dr. Clinton: Yeah, and they're just filling the hole in their heart, the hole in their soul. Dr. Greg Jantz: Well, it creates a lot of insecurity. Dr. Clinton: But what's getting complicated, though, is they're getting shoved in that direction though. Dr. Clinton: Because I'm angry with you, I'm mad at you because of what's happened to us in our marriage and I'm going to punish you for it and I'm going to use the kids to punish you, is what I'm doing. And, Greg, if you're on the receiving end of that, just for a moment, and I understand, I want to be careful here, we understand, we do not advocate for any violence or abuse, etc., in the home. We have a zero tolerance for that. So everybody hear us, we're not talking about that. We're talking, though, about situations where that's not occurring, but the parents are playing each other hard. Dr. Clinton: And you're right, they're playing them as pawns. These kids are pawns here. I'm thinking of situations, Greg, like in front of the other parent on a visitation or a pick-up or something, starting a fight. And fighting right in front of the kids. Dr. Clinton: And bring up raw issues. Dr. Clinton: Maybe fight over money or whatever. Maybe it's a fight over some type of custody thing. You get it. Dr. Greg Jantz: And what we do is, we also can fall in a place where we're giving the kid way too much information. Way too much. And usually that information is negative and it's not helpful. Dr. Clinton: So, like the starting fights, Greg, the belittling that can start taking place too. Belittling each other, you know, that's still his mom, that's still her dad. Dr. Greg Jantz: Absolutely. And what we can do, and you know with all your work on attachment, we can affect the bonding and attachment that will affect the kid later on in life. Dr. Clinton: Greg, what drives this parent alienation syndrome? You know, I've got some thoughts in my own mind. Of course, sort of the anger, revenge piece. That certainly is a piece of it. Dr. Greg Jantz: I think one of the drivers is going to be unforgiveness. I'm at a place that I'm still so angry and maybe I feel like a victim. I'm a victim, I'm angry, and really I haven't fully bridged that forgiveness. Maybe it's forgiveness of myself, forgiveness of the situation, forgiveness of the ex-spouse. But I'm so toxic with unforgiveness that I move over, 'cause I'm bitter, to, "I want to get revenge, I want to get even." So that's one of the first things to look for. Dr. Clinton: Yeah, I would agree with that, Greg. What about the whole revenge piece. Seriously, I've kind of alluded to it, but don't you think it plays in there? I want to even the score. Dr. Greg Jantz: Particularly if you feel like you've been the victim and this is terribly unfair, one of the dangers is, "I want to see him get-"
Dr. Clinton: I want to see you pay. Dr. Greg Jantz: Yeah. I'm going to get even here or I want to wish bad things on you. Dr. Clinton: Yeah. I wrote down, I think some parents are just afraid. They're like afraid maybe they're going to lose their kids. Dad's got all the money or mom's got all the money. Dr. Greg Jantz: Right. Then as a parent, I may feel like I have to do a lot of extra things to win back my child or my child's love. And that's a danger. So I'm going to do a lot of things that are special and look like special favor. I want to win that child's love back. And that's not going to work. Dr. Clinton: I wrote down too, I do think some parents genuinely want to protect their kids. Dr. Clinton: And they think, "He's dangerous, he's a bad man. I mean, he was controlling-"
Dr. Greg Jantz: And we understand that. Dr. Clinton: -he was crazy. I know he's doing the same thing to the kids. He's trying to brainwash them." Dr. Greg Jantz: And there's times that there are legitimate concerns and I want to make sure that that's understood as well. If it was an emotionally abusive environment, it was an environment where there could have been some form of physical violence, we do have, at times, some very legitimate concerns. So we want to also look at that. Dr. Clinton: Yeah, and the tragedy here, again, is the fallout on the kids because I mentioned caught in the middle earlier, they really are getting played, their emotional heart strings are just all over the place. They're all over the place. Typically, and I found this to be true in a number of cases that I've seen, that we tend to want to withhold information from our kids, believing the less they know about things, the less they're going to be impacted by everything. But nothing could be further from the truth. These kids are living in it, they're feeling it, they're a bundle of nerves. Dr. Greg Jantz: That's right. Dr. Clinton: And they're splitting, is what they're doing, they're dying inside. Dr. Greg Jantz: So they are. They're looking for their own identity. Remember the question for our kids is, "Where do I fit in?" And that's a question they're asking in a social group at school and at home, where do I fit in? And then importantly is, "how do I fit in?" Dr. Clinton: Yeah. Greg, how do you talk to a parent, and there could be many listening to us right now who they're in this, they're in this. And they're hurt, they feel violated, whatever the reason is. And the kids, they know, they can see it in their eyes, there's a challenge going on here because they are angry and they're frustrated. But how do you back off when you've got another parent involved in the picture here who isn't playing fair? Who's not playing by the rules? Who may be slamming you in court and may be trying to take everything you've got or badmouthing you across town, what do you ... that's what I see, what do you do? Dr. Greg Jantz: Right. Because there can be a lot of gossip, a lot of rumor, and a lot of interference and it can be done in a passive-aggressive way as well. They may smile at you when you see them to pick up the kids, but you know behind the scenes they're doing other things to hurt you. You remain faithful to loving your child or your children. They have security needs. So we want to look to have emotional needs met. And it's not all going to be on you. This is where the role of times for mentors and other influences in the family could be very, very important. If I have a young man and he doesn't really have a relationship with his father and things aren't going well, I'm going to be looking for a mentor and other positive, godly influence for that young man's life. Not just as an example, but remember they've got security needs and those are emotional security needs. You're going to remain faithful, consistent with who you are, consistent in your love, regardless what the other person does. Dr. Clinton: I'm with you. You know I'm with you, and you're right, Greg. My mind keeps drifting back to these scenes where, "But what if he's undercutting everything I'm trying to do? I'm trying to teach my son responsibility, to have boundaries with money, etc., and then when he goes over there, there's none of that." Dr. Greg Jantz: Mm-hmm (affirmative). Dr. Clinton: I mean, he wants to be a Disney daddy. Dr. Greg Jantz: Yes. Yes. Dr. Clinton: That's what he's doing, he's a Disney daddy over there and that's how he's winning their love and the truth is, the kids want to go over there. And so, "I'm caught," it's like, "I'm trying to a responsible parent here and I'm staring at my own checkbook and we're struggling." Dr. Clinton: I'm just trying to give a voice to this for a moment. It's not a fun place to be. How do I keep myself from going insane on this? Dr. Greg Jantz: I think one of the things we need to be sure we're doing is talking about, "You probably noticed there are different rules at dad's house and ours." You need to talk about it and talk about there will be differences. But you're going to go back to your steadfast love. But talk about the different rules, talk about ... we always want them to feel like they can communicate back. You know, sometimes you had a visit with their parent and they feel like they had a great time, but they're afraid to come back and say anything to you. We want to keep that bridge open where they can always communicate. And we want to be careful that we don't say anything negative about the other parent. Though some things can be true. Dr. Clinton: And the truth is, in the end, your kids will honor you for doing that very thing. Dr. Greg Jantz: They will. Dr. Clinton: Because if the other parent is badmouthing you, they're keeping a strong account of all of that. And by the way, they're looking at you and saying, "Is what dad's saying, or is what mom's saying really true or not?" Dr. Clinton: "Doing right doesn't always feel right, but in the end, it'll be right." Dr. Greg Jantz: It'll be right. Dr. Clinton: It'll be right. Dr. Greg Jantz: It will be pay dividends over time. Dr. Clinton: And the truth is, if you hold on here, Greg ... And then, what about encouraging parents to really press in on relationship here? This is really an important time not to get caught up in the war, but to say, you know what? You matter to me. And you start spending that special time with your kid and you try to get him relationally connected, develop emotional closeness with them. Let them know that you love them deeply and dearly. And by the way, I saw a quote recently, it said this, "some people are poor, all they have is money." Dr. Clinton: And that's strong, that's a strong statement because what we're looking for in the end, money can help things, we all agree with that, everybody gets it. But it really is about our relationship. Dr. Greg Jantz: Right, right. Dr. Clinton: Are we connected? Dr. Clinton: And you can connect and you can do great things that really, like Josh McDowell in the end says, "You don't make memories, you are the memory. Man, if you can own that, Greg, isn't that ... that's a big step." Dr. Greg Jantz: And give them that memory. Give them that security. And with that will come a greater sense of bonding with you and it will pay dividends over time. Dr. Clinton: But it's tough. Dr. Greg Jantz: Let's just say that again, it can be really tough. And there's days that you're going to feel very attacked, you're not going to feel good, your energy is going to be low. And it's going to be, you know, "Lord, God, give me the strength that I need for this day," because there's times that you can feel very attacked and probably you are being attacked. Dr. Clinton: High conflict homes, I'm going to keep pressing back into it, because high conflict homes is where you're going to see probably a lot of this parental alienation syndrome surface, okay? And these home conflict homes, Greg, it's like there's not a shutdown valve. Dr. Clinton: How do we go to another place, you hear the words mediation, arbitration kicked around quite a bit. What about seeking out outside help and what kind of help should they be looking for? Certainly a counselor, some type of supportive thing personally. Maybe as a family too, that the kids might want to be seeing somebody here because if you've got a deck stacked against you, it's the old Andrew Jackson quote, "You've got to get everything you can in that fight." Dr. Clinton: You need that outside reservoir of help because if you don't have that, I mean, you're a one-man band out there hanging on, trying to survive an onslaught of chaos. And you're right, you're in a big fight. Dr. Greg Jantz: Oh yes. Now, if you start to see behavioral issues with your kids, and by that I don't mean the normal things that kids do in testing boundaries, but you're seeing a lot of anxiety, you're seeing sleep is being effected, you're seeing a lot of anger issues, but you're seeing probably some struggles at school. You need to also be aware of social media, sometimes our kids are expressing themselves in social media, which is not always the best place to go. So, look for these things. That's an indication to me to go, okay, we need some outside help here. Dr. Clinton: Greg, I've seen some homes, even recently, where you've got kids, teenage kids, dropping some rough words. Dr. Greg Jantz: Oh, yes. Dr. Clinton: Yelling and screaming, throwing stuff and, you know, it burdens me because when I see these kinds of homes, I see a mom and/or dad frantically trying to get connected. What do you do, Greg, when behind closed doors, a lot of people listening right now, it's going on at home. They're out of control. Where are we going to go here? How are we going to deal with this stuff because this stuff here, this stuff is fueling all that. Dr. Greg Jantz: Don't carry those hurts alone. I think one of the things that we may tend to do is isolate, it's 'cause I feel so alone, I feel so alone in dealing with my kids or dealing my ex, that I feel alone. Then I isolate. And as I isolate, I'm going to probably add to my own depression or add to my own anxiety, so don't walk this alone. It's a counselor, it's somebody else probably that knows your journey. I think times there's helpful groups to be a part of. But don't let the hurts master you. Dr. Clinton: Yeah. And Greg, there's that old statement, hurt people hurt people. Dr. Clinton: You know that? And if you can see your kids as deeply wounded, these are relationship wounds that go deep in their soul and it gets confusing, it's conflictual for them. It's like scrambled eggs. You've heard of shaken baby syndrome, what it does is like rattles their brain, you know what I'm saying? Dr. Clinton: I often think of the yelling and the chaos in that same way, that they're brains literally become like scrambled eggs. It's so insane that they just can't assimilate it. Dr. Clinton: Can't put it together. And so they have a hard time attaching or calming themselves down in your presence. You see, and if you've got that kind of stuff going on, that's where you've got to get in and you've got to get some "relationship psychology" help, if you will. Dr. Clinton: Because until you get that going, until you get that emotional connectedness going, it probably isn't going to calm, is it? Dr. Greg Jantz: It's not going to calm. And remember, that's an attack on their self-esteem, their sense of value, their sense of feeling loved. And just think of your kid as that sponge. The kid's going to absorb all of that and it is, it's like a scrambled brain. That's well said, Tim. Dr. Clinton: Greg, I want to kind of give you the closing word here to talk to some parents who are caught up in this kind of pain and it's escalating. For some, it's completely out of control. Kids are out of control, the whole family nightmare. It's like the worst thing they could ever imagine. And I also want you to speak to the parents who don't get to talk to their kids or their kids hate them. It's all been fueled and all they do is cry themselves to sleep every night. Maybe even grandparents who are in those kinds of situations. Dr. Clinton: What do you say to them? Dr. Greg Jantz: There can be seasons where the kid is taking sides and by taking sides, you feel that you've been cut off and perhaps you have. I would say, that is extremely painful. To be cut off from a child that you've loved and you've sowed into their life, see it as a season. You remain faithful, don't do it alone, don't be isolated. Stay consistent in your love. And I'm going to add prayer. Pray for wisdom, also pray that your children will see truth. And don't give up on that prayer because we see situations where, you know, after a while, and it was just a season, it does come back around. So don't lose faith, don't lose hope, be faithful. Be really careful about these two things: self-blame. It's easy to blame yourself and get back to those what-ifs. "What if I would have done this differently, my kid would love me now." And you start to get into that self-blame, that sense that, "I'm a failure, I'm a failure." Be careful with that thinking. I understand how you can get there, but you've got to have a source of truth in your life and God's plans for you and for your children, hang on, we're going to do everything that you can and with help to move through this season. I've seen families and parents who have developed a much, much deeper relationship with their children. Granted, it may be some time down the road, but it's a very enriched relationship because they were faithful. Dr. Clinton: Don't do it alone. And I'd say this, you know, the scripture says that, "There is faith and there's hope and there's love, but the greatest of these is love." I, not long ago, went through the book of Psalms and I challenge everybody out there to do this very exercise, underline everywhere in the book of Psalms you see these words, steadfast love. God's steadfast love. Mom, dad, you may feel like there's little or no hope, you may feel completely rejected, like maybe you'll never get to talk to them again. Stay faithful like Dr. Jantz was saying. Dr. Greg Jantz: Stay faithful. Dr. Clinton: Love them with everything you've got. Keep showing up at the game, don't ever stop and I think, in the end, God will sow some seeds of hope and change into your life. Dr. Clinton: Dr. Jantz, thanks for being with us. Dr. Greg Jantz: It's an important topic, thank you. Roger Marsh: Incredible words of encouragement to end this very somber broadcast of Dr. James Dobson's Family Talk. 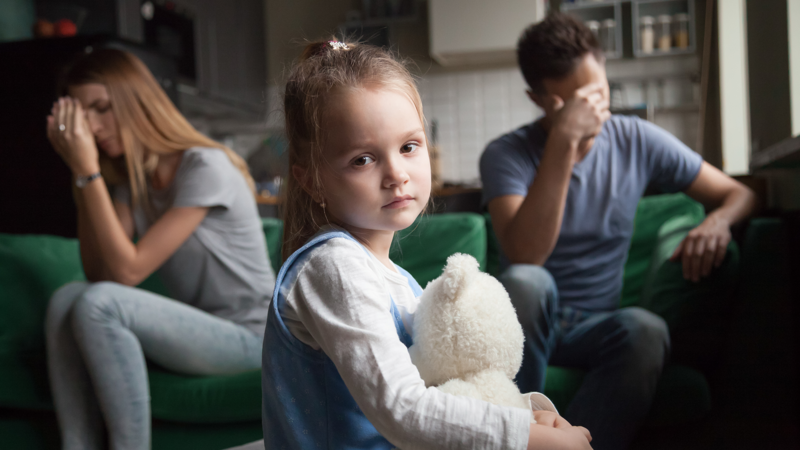 You've been listening to a discussion about the painful effects of divorce and parental alienation. If you're going through a difficult separation right now, we want you to know that we care. Call our offices at 877-732-6825 and select option 1 for our prayer line. Once you connect with us, a member of our team will be happy to pray with you. That's 877-732-6825 and then select option 1. You can also let us know your thoughts about this broadcast by calling our listener feedback line as well, dial that same number, 877-732-6825, and then select option 3 to leave a message in our inbox. Again, that number is 877-732-6825 and then select option 3. If you want to know more about today's guest, Dr. Gregory Jantz, visit the broadcast page at drjamesdobson.org. There you'll find links to his organization, along with his new book, Healing the Scars of Addiction. You'll find that on our broadcast page at drjamesdobson.org. I'm Roger Marsh, thanks so much for listening today and every day this week here on Family Talk. Be sure to join us again Monday for more insightful and informative broadcasts right here on Dr. James Dobson's Family Talk. Dr. Dobson: Well, thank you everyone for tuning in to our program today. You may know that Family Talk is a listener supported program. And we remain on the air by your generosity, literally. If you can help us financially, we would certainly appreciate it. Dr. Dobson: God's blessings to you all.